Oddball Stocks: Heelys selling for less than net cash, can they ever turn things around? Heelys selling for less than net cash, can they ever turn things around? I have been bouncing recently between a list of net-net's and a list of magic six stocks, while I was working on a magic six I decided to take a break and look at a net-net, Heelys was the next on the list. Heelys as a stock has the ick factor without a doubt but some aspects of the financials were interesting enough that I decided to turn some of my thoughts into a post. I should have the magic six writeup later this week. Heelys is what I would consider a fad product company. They develop shoes with a small wheel in the back. The purpose of the shoes is to allow the user to take a few steps then skate along quickly. The shoes were all the rage a few years ago, you couldn't go to a school, mall or park without seeing kids skating around on Heelys. The stock was also a high flyer, it IPO'ed at $32, rose to $38 and then sunk lower and lower finally reaching the current $2 price. So what killed Heelys? I think two things, the first was most schools started to ban the shoes in the name of safety. Once a ban was in place it was a lot harder for parents to justify a shoe purchase that could only be worn at home or outside. The second was fashion, by this I mean that kids who owned Heelys and thought they were cool grew up a bit and realized they weren't as cool anymore. Just like any fad at the time it seems like there is some sort of staying power but as quickly as it appeared the fad is gone. The shoes come with either one or two wheels and retail anywhere from $40 to $85. 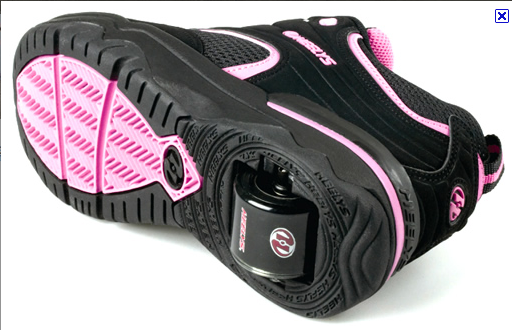 Heelys also sells another product called the Nano for $85 which is a weird sort of one foot skateboard thing that attaches to a Heely shoe using the wheel socket. To use the Nano a buyer would need to spend a minimum of $125 and up to $170. So the biggest thing that stands out is that currently Heelys is trading at a one cent discount to net cash per share. It is very rare to find a company in the US trading below net cash, this is a very cheap company possibly for good reason. If shareholders were able to force a liquidation there is a very strong chance they would see a nice return on their investment. The problem is it doesn't seem that management is willing to liquidate the company. This is something that Ben Graham points out in chapter 44 of Security Analysis. Graham states that often the interests of management and investors are in conflict, and based on the fact that American shareholders are the most docile creatures in the world it is unlikely shareholders will work to force change. Graham sets up criteria for investing in a net-net: either the company has a good chance of profitability in the future, or the company is currently profitable. To invest in Heelys an investor needs to have hope that the company will have some sort of reversion to the mean turn-around at some point in the future. So how does the company stack up on an operating basis? In one word terribly.. The ten year results of Heelys aren't pretty, the company's revenue rose from $20m in 2001 to $188m in 2006 the year before their IPO. In 2007 revenue was $183m before it fell off to $71m and most recently $29m. The fall in revenue wouldn't be a problem if the company sized their operations accordingly. Unfortunately that hasn't been the case, operating income was last positive in 2007, and operating expenses have been rising since 2004. The cash flow is just as bad, the company briefly had positive operating cash flow in 2010, but otherwise it's all been negative. 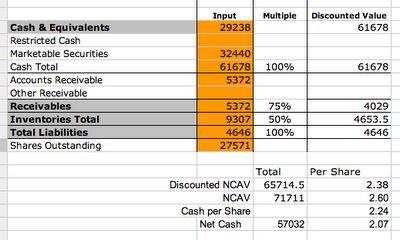 The cash burn isn't terrible, but it's a steady drip emptying the balance sheet. I would best describe the financial history of Heelys as follows; the company went public with record results, they saved their earnings and have worked off the excess hoping to create the next fad. So the question I have to ask myself is do I trust Heely's management to do the best thing for shareholders and liquidate? If they don't liquidate do I think their market will improve? Based on the fact that the product was a sort of fad and not depressed as a result of some sort of slack in demand or over capacity I don't have any sort of assurance that the market will ever turn positive for them. After browsing their filings and reading through their website my takeaway is that management intends to keep charging forward until either they suddenly strike gold and turn profitable or run out of cash. I've passed on Heelys but I'd always love to read the bull case. Not that I would have bought Crox in the similar situation 2-3 years ago, but my sense is Heely's is even worse. Crox banked on those gardening clogs, but they've been able to extend the brand since Crox doesn't equal just a gardening clog. Even their original fad is still worn by plenty of people, even kitchen workers and such. Now they have sandals and seem to have right sized the business. Heelys though, I have to think only has mind share in the wheel in heel market unless they cant pull off another product that incorporates bizarre stuff in the heel of shoes. So not that I would have given Crox a chance of pulling off what they have, Heelys seems even more distantly capable of doing so. Hey Nate, love your blog. It's one of the few blogs I don't miss a post. My question about net/nets, where do you get your net/net list from, a screen? So far I haven't found a reliable one that has correct info. I agree with you Crox built a viable brand whereas Heelys is a one product company. As for Crox and how goofy they look the shoes are awesome if you have a little kid, just slip them on and you're good. I believe my son has two or three pairs. I did notice that there is a hedge fund that has been buying Heelys, but from what I gathered it didn't seem like a value fund but more of a fund focused on turn arounds. So there is likely to be even more pressure to get new products out the door. There are a lot of China reverse merger companies on the list, but most of them are grouped together at the top, I just avoid those. Another great site is: http://stocksbelowncav.blogspot.com/, although the author posts sporadically net-nets are covered. Sorry, I thought I had my google account signed in this morning. I've seen GrahamInvestor site, maybe what threw me was all the Chinese companies. I've owned Heelys, in fact I still have them in adult sizes. Even as a grown-up (well, 26) I find the shoes genuinely useful for getting around my city walking at approx. twice normal speed and with less effort. I'm not saying they could turn it around, but if they have any chance it's changing their marketing and design to adult tastes.